I'm very sorry that we forgot to include this information in the newsletter and blog post. Thank you very much for your support. We are happy to have you as a customer and will do our best to work within App Store regulations to provide you with a way to get a discounted upgrade to FotoMagico 5 Pro. Once FotoMagico 5 is ready, we will make it available on the Mac App Store. Customers who bought FotoMagico 4 on the Mac App Store will be able to upgrade to FotoMagico 5 Pro at the same discount as customers who bought FotoMagico 4 outside the Mac App Store. However, we are not able to offer the Early Bird Sale on the Mac App Store as the Mac App Store doesn't allow the sale of beta versions. We are currently working with the Mac App Store to get FotoMagico 5 approved. We will inform you once FotoMagico 5 is available on the Mac App Store. The FotoMagico 5 beta test is making great progress and the final version will be released soon, thanks to many testers and their feedback. Watch the Demo Slideshow to get a first impression of its creative power. While we are putting the finishing touches on the product and ironing out some more bugs, we're kicking off the product launch with the Early Bird Sale. The Early Bird Sale ends Jan. 31st. 2016. Important information for Mac App Store customers. The biggest challenge in creating a compelling slideshow is to come up with the story. FotoMagico 5 comes with pre-built stories called "Snippets." Simply choose a Snippet and add in your own photos and videos, resulting in a beautifully made slideshow that tells the story of your latest travel adventure or family gathering. If you want to compose your own original story, Snippets for intros, outros, opening titles, closing credits and complex screen layouts help you get it done faster. 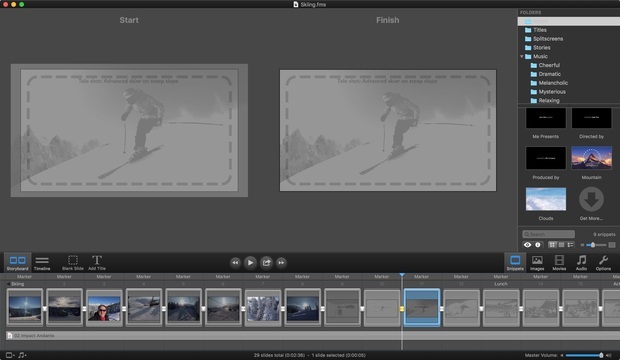 Topping things off, creating your own Snippets lets you streamline the production of slideshows for your clients. FotoMagico 5 comes with free CC licensed music by Josh Woodward and Kevin MacLeod for different moods. 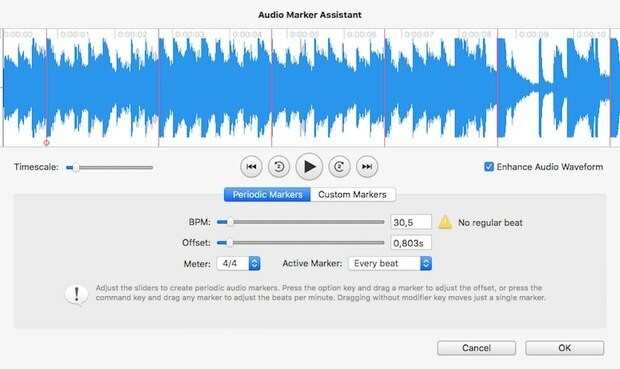 These Snippets contain perfectly timed audio markers so your story is synchronized with the matching music and an attribution slide for keeping out of copyright troubles. Editing and formatting titles has been much improved in FotoMagico 5, removing the pain of working with the OS X font panel. If you present your slideshow in front of a photo club, for example, you might want to insert info such as EXIF metadata – the date the photo was taken, ISO, exposure, aperture and the like – from your photos. Additionally, you may want to include title and artist of the music just playing, slide number and slideshow author – all this can now be edited into the titles dynamically with Text placeholders. Your photos and videos really stand out against the new, dark user interface. Whether you are a digital scrapbooking novice or a FotoMagico Pro since day one, the latest version is designed for beginners, experts and everyone in between. FotoMagico 5 is simplicity at its finest, focusing on what really matters: the creation of beautiful slideshows. FotoMagico 5 requires OS X 10.10 Yosemite or newer. 8 GB of RAM and a dedicated graphics card is recommended. At Box of Light Studios, creative thinking is king. Providing children ages 6-14 with an environment for creative learning, Box of Light features classes designed to teach students animation, film, comics and more, fostering necessary skills such as collaboration, problem-solving and communication. In public studio classes, students are able to explore animation techniques and complete their own movies with sound effects and titles. Keeping the emphasis on creative planning and development, innovative software iStopMotion is used in these animation classes because of its user-friendly interface. In addition to public studio classes, Box of Light also utilizes iStopMotion in their Artist Residency programs. Residencies are 20-60 day partnerships with schools where an artist partners with classroom teachers to integrate art into existing core curriculums. Check out the example above from a fifth grade class in Turbotville Elementary, which combines stop motion fun with polygon education! But that’s not all Box of Light offers for students who are excited about learning the ins and outs of animation! For the most serious animation students, Box of Light offers an animation club where students collaborate on a long-term project with the goal of submitting the final product to festivals and competitions. Although it is the newest program offered, it has already yielded impressive and imaginative work. See for yourself here! Through this simple to use and creatively freeing software, students are able to think critically about creative problem solving, something that makes teaching especially rewarding for educators at Box of Light. We can’t wait to see how Box of Light Studios continues to implement iStopMotion into their ever-expanding and evolving programs! Our developers are working hard on the next FotoMagico Version. The latest beta adds the option to ignore Storyboard authoring alerts about images size or file format, automatically de-interlaced video playback and various fixes like correctly displayed progress bars on OS X Yosemite, faster creation of standalone players and exports and much more. Download and full version history are available on the website as usual. The latest update available at the Boinx Software Website and the App Store changes the usage of the mouse scrollwheel to no longer changes master volume during playback and fixes several issues like the Standalone Player functionality and more stable movie playback. Get the latest download and see the full list of improvements.